1. Poor oral hygiene. Certain types of oral bacteria cause bad breath, and the mouth provides a perfect environment for them—especially when dental plaque and food debris is not well cleansed. So to keep your breath fresh, maintain a diligent oral hygiene routine. This includes brushing your teeth twice a day with fluoride toothpaste and flossing at least once a day. For an extra-clean mouth, use a tongue scraper—a plastic tool about the size of a toothbrush that's available in most drug stores. This will remove bacteria and food debris from your tongue for extra freshness. 2. Oral diseases. Bad odors in your mouth may also be caused by infections—which is what tooth decay and gum disease actually are. Sometimes old fillings wear out, allowing bacteria to re-infect a tooth that was once treated for decay. Other signs of these common oral diseases include tooth pain and bleeding or puffy gums. If you notice any of these, don't ignore it—make a dental appointment today! 3. Diet. Smelly foods will give you smelly breath; it's that simple. And the odors may linger after you have eaten them. When onion, garlic and other pungent foods are digested, their odor-producing substances enter your bloodstream and proceed to your lungs—which can affect how your breath smells. 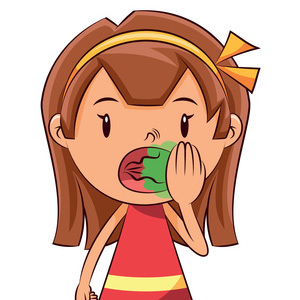 If you suspect your dietary habits are causing bad breath, try eliminating certain foods (at least temporarily) and see if that helps. 4. Dry mouth. Saliva helps cleanse your mouth, so reduced saliva flow can lead to bad breath. This accounts for "morning breath," which is caused when the mouth dries out during sleep (especially if you are a mouth-breather). However, some people don't produce enough saliva throughout the day. Sometimes it's just that they don't drink enough water. But a very common cause of chronic dry mouth is regular use of medications, both prescription and over-the-counter. If you notice that medication is drying out your mouth, let your doctor know. And stay hydrated! 5. Smoking. 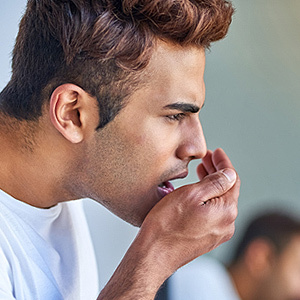 Given that smoking increases your risk for many serious diseases, including oral cancer, the fact that it can lead to bad breath seems almost trivial. Still, it's worth noting that smoking causes mouth odor both directly and indirectly by reducing the flow of saliva and promoting gum disease. In fact, tobacco in all forms is a hazard to your health. Q: I often seem to have noticeably bad breath — not just in the morning. How unusual is this problem? A: Persistent bad breath, or halitosis, is a very common complaint that is thought to affect millions of people, including perhaps 25 to 50 percent of middle aged and older adults. It’s the driving force behind the market for breath mints and mouth rinses, with an estimated value of $3 billion annually. It’s also the third most frequent reason people give for seeing the dentist (after tooth decay and gum disease). So if you have bad breath, you’re hardly alone. Q: Can bad breath come from somewhere other than the mouth? A: Most of the time, bad breath does originate in the mouth; its characteristic smell is often caused by volatile sulfur compounds (VSCs), which have a foul odor. However, it can also come from the nose, possibly as a result of a sinus infection or a foreign body. In some cases, pus from the tonsils can cause halitosis. There are also a few diseases which sometimes give your breath an unpleasant odor. Q: What exactly causes the mouth to smell bad? A: In a word: bacteria. Millions of these microorganisms (some of which are harmful, and some helpful) coat the lining of the mouth and the tongue. They thrive on tiny food particles, remnants of dead skin cells, and other material. When they aren't kept under control with good oral hygiene — or when they begin multiplying in inaccessible areas, like the back of the tongue or under the gums — they may start releasing the smells of decaying matter. Other issues can also contribute to a malodorous mouth. These include personal habits (such as tobacco and alcohol use), consumption of strong-smelling foods (onions and cheese, for example), and medical conditions, like persistent dry mouth (xerostomia). Q: What can I do about my bad breath? A: Those breath mints are really just a cover-up. Your best bet is to come in to the dental office for an examination. We have several ways of finding out exactly what’s causing your bad breath, and then treating it. Depending on what’s best for your individual situation, we may offer oral hygiene instruction, a professional cleaning, or treatment for gum disease or tooth decay. Bad breath can be an embarrassing problem — but we can help you breathe easier.